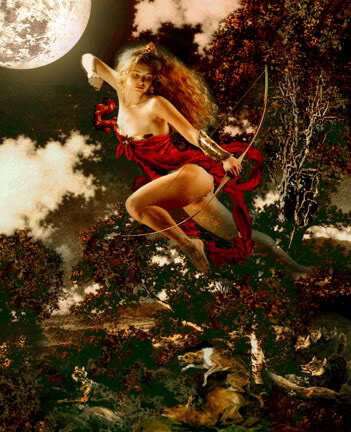 Diana is the Roman Goddess of the woodlands, wild animals and of the hunt. In ancient times as Rome's contact grew with Greece, Diana was more and more identified with the Goddess Artemis. In time the two Goddesses became virtually identical, though in modern times she is usually identified as "Diana". Diana is most often portrayed a hunter, often with a bow and quiver, accompanied by maidens, hunting dogs, or deer. In this aspect she is considered to be a pure and virginal Maiden Goddess of the Moon. Diana is honored by women because of her association as a Goddess of childbirth, nursing and healing. In this aspect she is considered to be a Mother Goddess. Because Diana was also identified with darkness and witchcraft and served as a Goddess of the Underworld, she is also considered a Crone Goddess. As a true Triple Goddess her nature was a varied as her many aspects. She could be pure and virginal, maternal and loving, or arrogant and vengeful. She is as changeable and unpredictable as nature. Sculptors sometimes created statues of her with three heads: those of a horse, a dog, and a boar. Such statues were displayed at places where three roads met. The most celebrated place of worship for Diana was a sacred grove beside Lake Nemi, at Aricia near Rome. 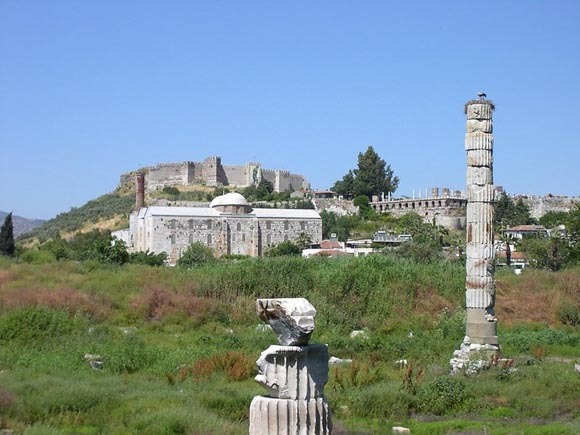 The ancient Greek city of Ephesus was another center for the worship of Diana. The goddess had a magnificent temple there that took 220 years to construct and was regarded as one of the seven wonders of the ancient world. Within the temple was a famous ebony statue of Diana. The upper body of the statue was entirely covered with breasts, symbolizing Diana's role as goddess of fertility. With all things wild and free. May we be one with nature made. Whose sevenfold pipes make music sweet. Be here as we merrily meet! And unto you the wine we pour. Ye we invoke by ancient lore. Borne on the moonbeam's of silver light. Ere from this circle we depart.